General presentation of the "Inspection des affaires sociales"
The “Inspection Générale des Affaires Sociales” (IGAS) is the French Government audit, evaluation and inspection office for health, social security, social cohesion, employment and labour policies and organisations. Established in 1967, IGAS is a high level internal unit which has oversight over all social programmes and operations through internal audits and investigations. IGAS also contributes, as an internal consulting unit, to the efficiency and quality of government decision making. It is a major source of advice for the Government in the area of social policies. It is also one of the most trusted sources of information and expertise for all public and private stakeholders and the general public in these areas. Led by a General Inspector, currently Mrs. Nathalie Destais, it includes around 130 professionals from various backgrounds (ENA – National School of Administration, hospitals, labour administration, medical doctors, pharmacists, engineers, etc…). IGAS comes under the authority of the ministers in charge of health, social and labour affairs and may also be consulted by the Prime Minister and other ministers (for example : Ministers of housing, urban policy, immigration and the civil service). IGAS has jurisdiction over all institutions, whether public (governmental, regional and local authorities, agencies, joint commissions, etc.) or private (companies, NGOs and charities, etc. ), if they receive public funding or appeal to public generosity. 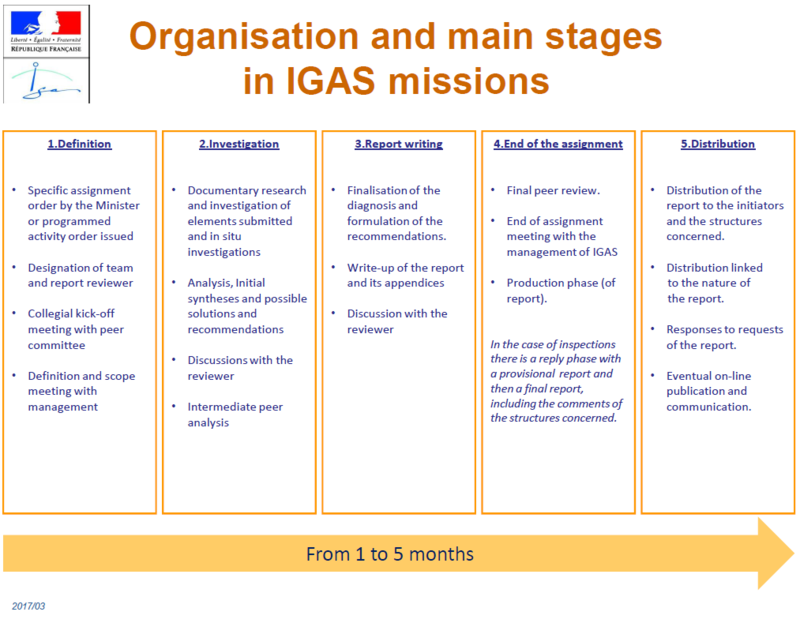 In each IGAS mission, carried out by teams of two to four inspectors, the General Inspectorate investigates, upon the request of ministers, how public policies and departments operate and submits strategic and operational recommendations. To fulfil its missions, IGAS has developed a comprehensive and effective quality audit, evaluation and inspection approach : meetings and investigations based on documented evidence and on-site investigations, conducted over several weeks by teams of experts in the field who are in charge of writing the report ; subsequent peer review of the analysis and recommendations of the report, and a bilateral procedure for some reports. The reports are written in an independent manner by IGAS members. Around 41% of assignments are related to health, 24% are related to labour and employment policies, 18% to social cohesion and 17% to social security. 39% of assignments are conducted jointly with other general inspectorates (finance, interior, education, justice).